overall: 97.8 x 160 x 107.9 cm (38 1/2 x 63 x 42 1/2 in.) gross weight: 4000 lb. Scott Burton called himself a "public sculptor" and created works that appeal to a wide-ranging audience. His later sculptures tend to be utilitarian, placed in private gardens, in public squares, or in museums. Burton challenged the boundary between the find and the decorative arts: his sculpture not only represents furniture—it is furniture. The casual observer, accustomed to looking but not touching, thus becomes and active user. In making art that is at once beautiful and useful, Burton followed in the tradition of predecessors including the Russian Vladimir Tatlin and the Dutch De Stijl artist Gerrit Rietveld. Burton began his formal training in Washington, DC, with the painter Leon Berkowitz, who was linked to the Washington Color School artists such as Morris Louis and Kenneth Noland. During the late 1950s, he studied with the abstract expressionist painter Hans Hofmann in Provincetown, Massachusetts. Burton began to experiment with the concept of furniture in the early 1970s, prompted by his forays into performance art a decade earlier. In 1975 he completed a bronze chair cast from an actual chair that he salvaged from belongings left behind by the former tenant of his New York City apartment. Burton turned to furniture tableaux, thoughtfully arranging pieces in both interior and landscape settings, and went on to parody furniture styles, often in unlikely materials. Adirondack Chair, for example, is based on the simple, angular wood chair created in the early twentieth century. 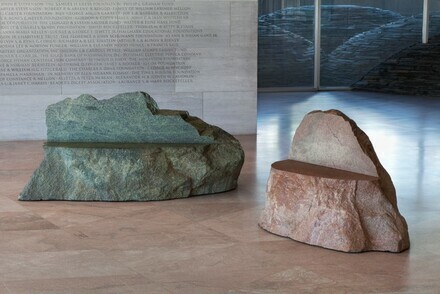 Around 1980, Burton conceived a rock chair series made from boulders and outcroppings. The dense, unyielding materials—typically granite, schist, marble, or lava—offer surprising contrast to the works' inviting designs. The Gallery's Rock Settees embody this rock-chair idea. Unlike some of the artist's other furniture sculpture, such as Lounge Chair and Rustic Table, which are based on existing forms, the natural-looking rock chairs and settees have no direct source. They are Burton's unique design. The process of making Rock Settees reflects Burton's approach in the early 1980s. Although manipulation between the raw material and the final sculpture was minimal, the process was both elaborate and demanding. Burton identified three main stages in creating his rock furniture: selecting the material, in this case freestanding boulders from Cold Spring Granite Company in Minnesota; studying the stone carefully and marking the surface to indicate the location of the cut for the base; and directing the precise location of the horizontal and vertical cuts forming the seat. Composed primarily of quartz, feldspar, and mica, the boulders used in Rock Settees are about one million years old. When initially approached from the back (as the sculptor preferred), the Rock Settees possess a natural, untouched appearance. Viewed from front and sides, the smooth slices into the stone contrast with the rock's rough surface, inviting a dialogue between refined and unrefined. The natural texture of the granite, with its multiple veins and fissures, suggests a kind of upholstery. The National Gallery also has a large outdoor Burton sculpture: an edition of Burton's Six-Part Seating (conceived 1985, fabricated 1998). The first edition was produced for the Mellon Bank in Pittsburgh in 1985. The second and final edition was given to the Gallery as a gift by the 1998 Collectors Committee. It was fabricated in 1998 for the Gallery's Sculpture Garden, where it remains today. Like Rock Settees, Six-Part Seating is a work of strong sculptural presence with a functional purpose. (Max Protech Gallery, New York); purchased 1988 by NGA. Sculpture: An Illustrated Catalogue. National Gallery of Art, Washington, 1994: 36, repro.